Tipard DVD to FLV Converter for Mac for the benefit of the general populous for its intuitive user interface and the easy-to-use DVD to FLV conversion program. With this Mac DVD to FLV Converter, you can make it easy to convert your favorite DVD to FLV videos on YouTube, Google Video, Myspace, Yahoo! Video, etc. ...... DVD to FLV, trim any section of the DVD , crop any play region, merge several selected titles and chapters into one file, even edit your video effect. Now, share your beloved DVD video on the website or other network propagation ways with the help of the powerful Mac DVD to FLV Converter. A professional Mac DVD to FLV Converter fully compatible with Mac OS X, support Leopard and Tiger, which manage on computers with either Power PC or Intel processors. 2. Convert DVD to FLV for mac. Convert your favorite DVD to FLV videos on YouTube, Google Video, Myspace, Yahoo! Video, etc. You could trim any segment audio you want to rip from DVD by set the exact start and end time. Qweas is providing links to Tipard DVD to FLV Converter for Mac 3.6.06 as a courtesy, and makes no representations regarding Tipard DVD to FLV Converter for Mac or any other applications or any information related thereto. 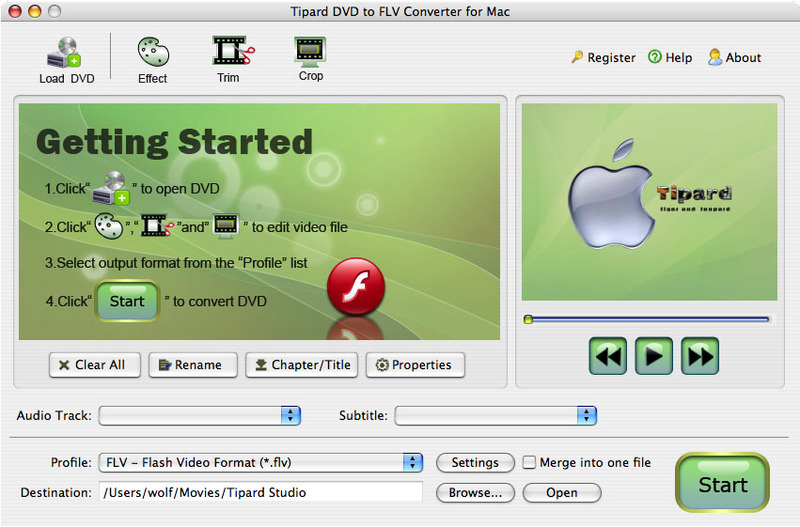 Any questions, complaints or claims regarding this application Tipard DVD to FLV Converter for Mac 3.6.06 must be directed to the appropriate software vendor. You may click the publisher link of Tipard DVD to FLV Converter for Mac on the top of this page to get more details about the vendor.